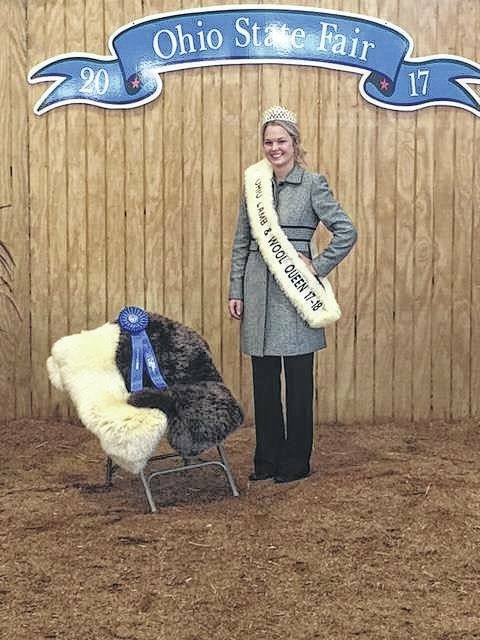 Courtney Hagler, was crowned the 2017/18 Ohio Lamb and Wool Queen Sunday, July 30 at the Ohio State Fair. She was crowned queen and then participated in the Ladies Lead and placed first in her age division. Courtney is a college grad student with her associate degree in agriculture production from SSCC and will be enrolled this fall to continue her education as a register vet tech. This fall and winter she will be traveling around Ohio to support the wool industry and participating in other county fairs along with open lamb shows. https://www.recordherald.com/wp-content/uploads/sites/27/2017/08/web1_IMG_2364.jpgCourtney Hagler, was crowned the 2017/18 Ohio Lamb and Wool Queen Sunday, July 30 at the Ohio State Fair. She was crowned queen and then participated in the Ladies Lead and placed first in her age division. Courtney is a college grad student with her associate degree in agriculture production from SSCC and will be enrolled this fall to continue her education as a register vet tech. This fall and winter she will be traveling around Ohio to support the wool industry and participating in other county fairs along with open lamb shows.